February 2018 – Shop. Learn. Experience. Coordinate visits with friends in advance. 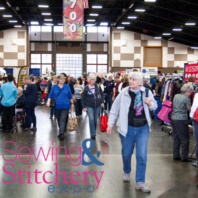 One of the best things about the Sewing & Stitchery Expo is sewing friends gathering from across North America. Even if you are attending alone, no worries! You are surrounded by sewing friends in waiting. For many, this is the annual chance to meet up. Have your friends’ cell numbers programmed into your fully charged phone. When muting your phone during classes, remember to use the vibrate mode so you can receive text messages. Remember that the days can be long and you may be using your phone more than normal so you may want to bring a portable charger with you. Check the schedules in the Showplex for classes, free stage events, drawings and more. Enjoy the variety of foods at Sew Expo. The food selection is just as extraordinary as the class schedule. No show has more delicious food. The variety and quality is A.M.A.Z.I.N.G. 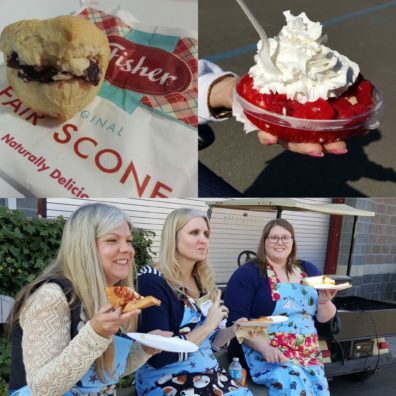 I’m talking about the famous Fisher’s Scone or one of those fantastic French Crepes!! Take advantage of the location, the food, and (hopefully) the weather. Arrange to meet friends outside, eat at the picnic tables or take a simple break between classes. Keep track of your possessions. But, if you misplace a tote or phone, check the Visitors Information booths in the rear of the Showplex and Pavilion. Each year lost and found items are turned in to these two locations. Take advantage of the wonderful entertainment offered Friday and Saturday nights. These special events are perfect to enjoy with friends old and new. 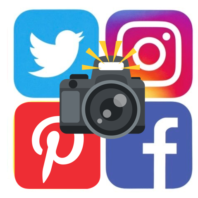 Share laughs, create memories, and learn while you’re at it! This year Joe Vecchiarelli heads up Friday Night Live full of comedic anecdotes and fashion straight from your favorite shows like Dancing with the Stars. Not to mention he’s bringing a special guest, winner of season 16 of Project Runway, Kentaro! 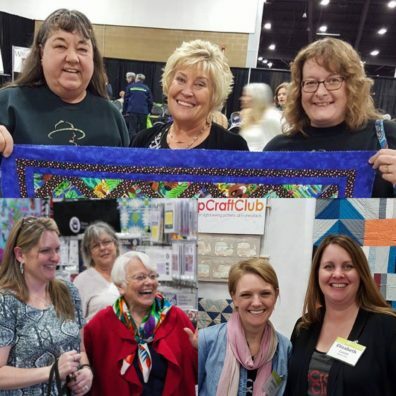 The Stitchin’ Post’s Valori Wells will grace the stage Saturday for the annual Quilter’s Night Out with more than 60 of her favorite quilts from over the years and share with you some stories from her vast experience in Textiles. Attend style shows upstairs in the Pavilion and the Free Stage presentations in the Showplex. With a little planning, these locations provide a nice opportunity to hook up with friends, sit for a bit and take a break from the action. The bonus is — you might learn something new. Try something new!  Expo is all about fine tuning our skills and expanding horizons! 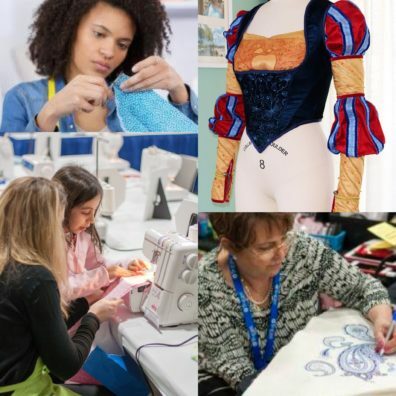 Maybe it’s time to test your garment sewing skills in a new realm such as cosplay! Or, after years of stitching quilts you want to pick up a pair of needles to being knitting…who knows? What’s for sure is that Expo is the place to test the water! My last, and most important, tip… WEAR COMFORTABLE SHOES. My shoes are to my happy day what my sewing machine needle is to my happy sewing. No matter how wonderful your sewing machine is, if your needle is not right, it WILL NOT SEW properly. Same thing with my shoes. It doesn’t matter how much time or money I put into my Sew Expo experience — if my shoes aren’t right — my day will be uncomfortable. About the author: Rhonda Pierce is spokesperson for SCHMETZneedles.com. She is giving the popular SCHMETZ classes each day at 9:30AM. Rhonda also serves as a contributor to the Expo’s FB page during the show so you may see her around taking lots of photos to share. She loves to see the outfits and projects you made. Be sure to say hello, and have your pic taken by Rhonda! Embroidery is everywhere! 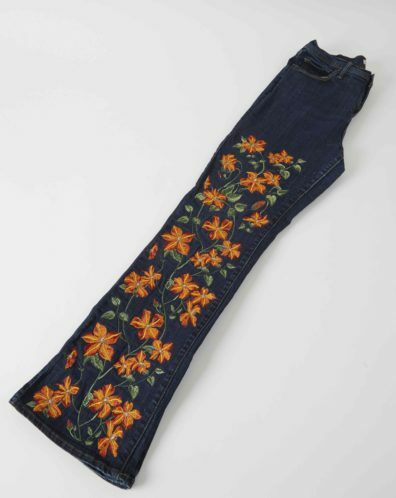 Jeans, blouses, bags, even shoes – embroidered embellishment is blooming on all elements of apparel and accessories. Traditionally, embroidery was limited to expensive items created expressly for special occasions. Luckily, the introduction of home embroidery machines make it possible for home sewists to make their own beautiful creations suitable for any lifestyle. Creating fashion embroidery is a wonderful way to enjoy your embroidery machine. Success at embroidering fashion lies in understanding design flow, contrast and color, and optimum stabilization. True fashion embroidery is more than simply placing a design onto a garment or accessory. Consideration should be given to the scale of the design in relation to the wearer and area to be embroidered. Ideally, the embroidery should have a natural look, as though it was grown on or woven into the garment, rather than simply placed at random. Use printed templates or embroidery software to audition your designs and create a pleasing effect. Color and contrast are equally important elements as design placement. Although subtle differences between thread colors are beautiful, they may not allow individual elements to show in the overall design. Often a slightly bolder color choice with a bit more contrast will provide a more pleasing effect. Similarly, the color of the fabric background, as well as its relative lightness or darkness, needs to be considered. Dark colors do not show well on a dark background, nor light colors on a light background. Be careful to use enough contrast to ensure your designs will show. Finally, proper stabilization is needed to support your embroidery and keep it looking its best. Using too little stabilizer can result in puckering and other fabric distortion, as well as cause design outlines to stitch incorrectly. Yet stabilizer should not interfere with the wearability of your garments. Using two layers of lightweight cutaway stabilizer, for instance, gives excellent support and is softer and easier to trim attractively than one heavy layer. Be sure to match the amount of stabilizer support with the density of the designs you are stitching. Embroidery is not only fashionable, it is a wonderfully creative way to have sewing fun! There is an amazing wealth of designs available and an unlimited array of threads to choose from. With a little attention to preparation you can successfully stitch your own fabulous creations. 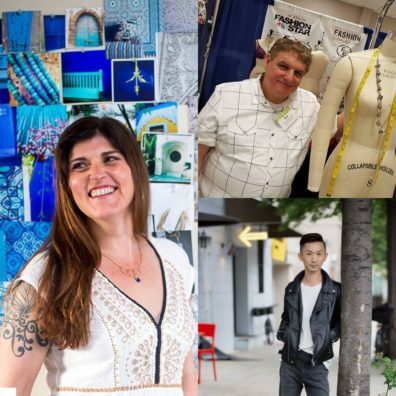 About the author: Katrina Walker is a regular contributor to Creative Machine Embroidery and hosts two online embroidery classes for BurdaStyle Academy – Fashion Embroidery with Katrina Walker, and Embroidery Essentials: Fabric Focus. Join Katrina at Expo! Register for her classes now!